Paddy Bradley guided Derry past Donegal in Ballybofey to book an Ulster Championship semi-final against Fermanagh on 21 June. The full-forward scored 10 points as Derry came back from three points down at half-time to turn the game around with a superb second-half performance. Both goals came in the first half with Eoin Bradley scoring and Michael Murphy blasting a penalty home for Donegal. Colm McFadden scored six points for the losers and Rory Kavanagh a couple. Donegal started the brighter as they scored the first couple of points through David Walsh and McFadden. However, the Bradley effect began to take its course with Paddy twice knocking over points to level and in the 12th minute came the opening goal from his brother. 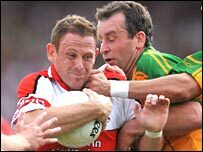 A long direct free into the Donegal red zone saw defender Eamon McGee mishandle the high ball and Eoin Bradley pounced and in one movement crashed the ball past Paul Durcan. Unconcerned, Donegal slowly but surely came right back into the game and by the 21st minte were level again. Skipper Kevin Cassidy banged over an excellent point after great approach play and then a double from McFadden's sweet left foot saw the scoreboard at 0-5 to 1-2. 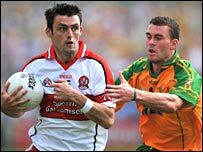 With Derry misfiring with a succession of wides, Donegal swept into the lead on the half hour thanks to maturely-taken penalty by teenager Michael Murphy after Kevin McGuckin had brought down Christy Toye on the edge of the square. Derry finally brought a 20-minute barrren spell to an end when Conleith Gilligan floated over a free in the 33rd minute. Enda Muldoon and Kavanagh swapped points immediately on the restart before the Donegal free-taker showed that he was on tip-top form with a long-range effort. But it was a splendid effort from youngster Murphy that caught the eye with a jinking run and a point off the outside of his right-foot. McFadden, though, missed a simple free that would have stretched Donegal's lead, and it proved a turning point in the game. The points came thick and fast as Derry fought their way back thanks again to the Bradley brothers with Paddy notching four and Eoin another to level the game up again on 55 minutes. Derry inched ahead with 11 minutes to go when Bradley battled for the ball, broke clear, did a shimmy and planted the ball over the bar. It was all Derry in the final stages with sustained bouts of passing leaving Donegal frustrated with Bradley scoring the Oak Leafers final four points. Donegal: P Durcan, K Lacey, N McGee, P Monaghan, F McGlynn, E McGee, B Dunnion, K Cassidy, N Gallagher, C Toye, M Hegarty, R Kavanagh, M Murphy, C McFadden, D Walsh. Derry: J Deighan, K McGuckin, K McCloy, F McEldowney, G O'Kane, N McCusker, M McIver, F Doherty, J Diver, M Lynch, P Murphy, E Muldoon, C Gilligan, P Bradley, E Bradley.